Lost in the Andharban jungle!! Tumbled down some eight-ten feet!! Ripped my clothes. Felt the hunger!! Lost the Devkund waterfall trail!! Camped near a lake!! Trekked 40 kms !! Yes, it all happened in a day. One fine day, I found myself into the Andharban jungles carving my way through the dense and dark, suffocating undergrowth, battling through the very air, which hung heavy, moist and still.The sounds of the insects, the birds, and the waterfall created a symphony of nature calling me deeper into the jungle. 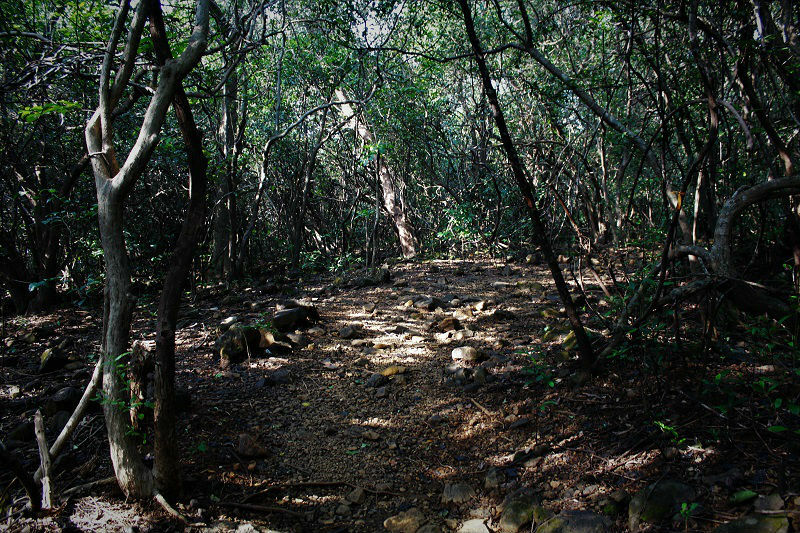 Andharban jungle means the trek through the dense and dark, to see mountains and jungles, that at a few places the sun-rays don’t reach to the ground at early afternoon too and one may not find any route out of it if lost. 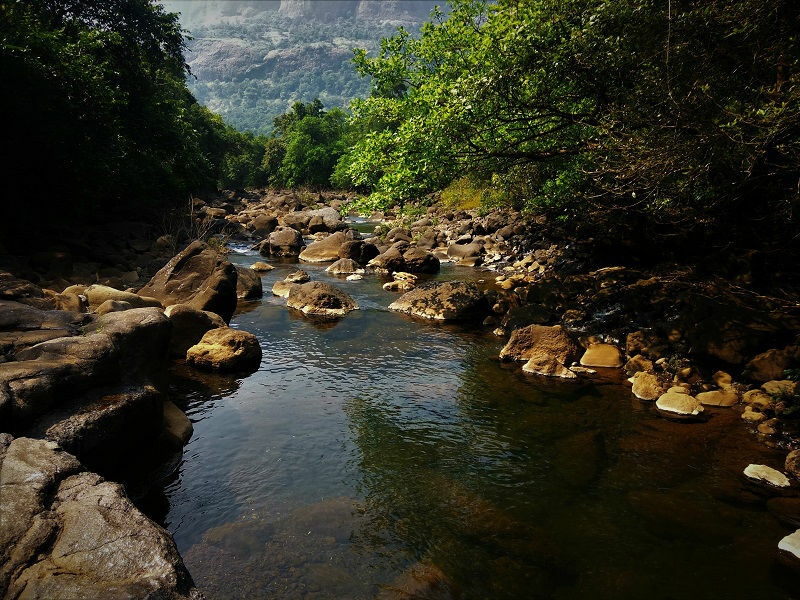 This trek is surrounded by Mountain ranges of Tamhini Ghat, Kundalika Valley, and Bhira (Unnayi) Reservoir, which offers endless trudge through the thicket forest. And, to add more to the excitement, at the end point of Andharban jungle trek (Bhira Dam), another trek starts for the Devkund Waterfalls. The trek is again through the thick overwhelming forest and leads you to a standout among the most wonderful waterfalls you would ever envision. 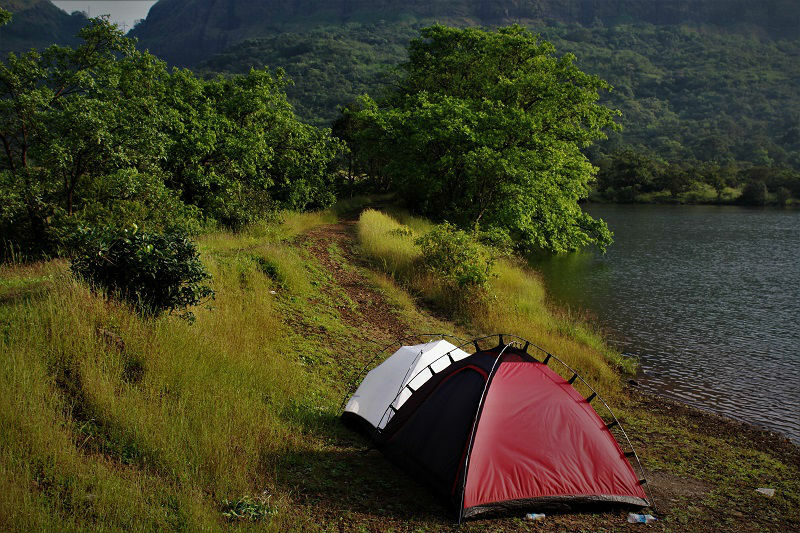 The start point is situated near the Mulshi dam on the Tamhini Ghat road. 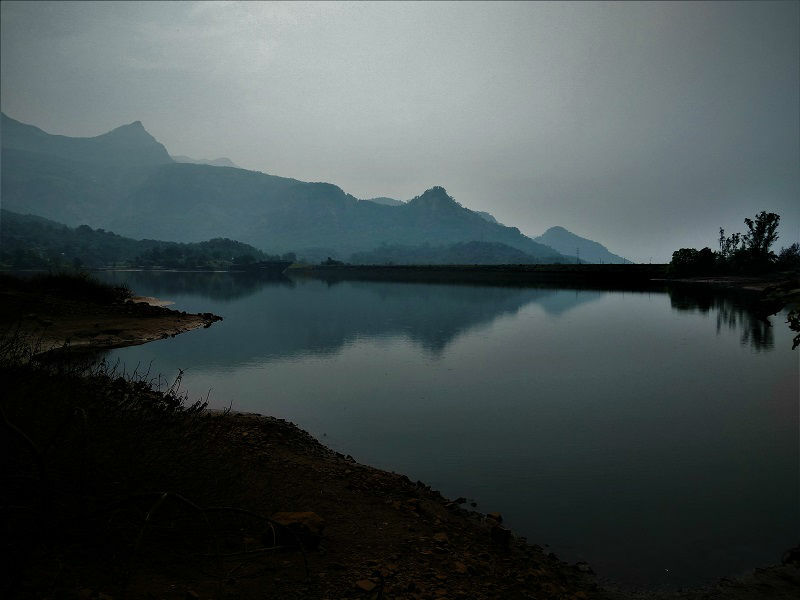 Mulshi Dam is around 130 kms from Mumbai and 50 kms from Pune. 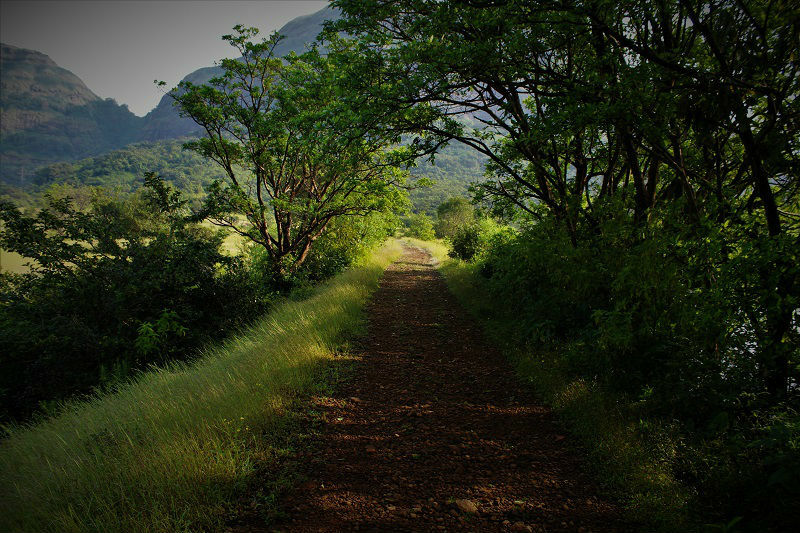 Take a bus which is plying on the Tamhini Ghat road route and get down at the start of MCKS Ashram Road. From here the start point is just 3 kms away. I would suggest you to put the location as Andharban Trail start point on Gmaps and you can navigate appropriately. At the start point, you will see a small Pimpri dam. The trail is little confusing. Just near to the dam, you will see a trail going along the dam. 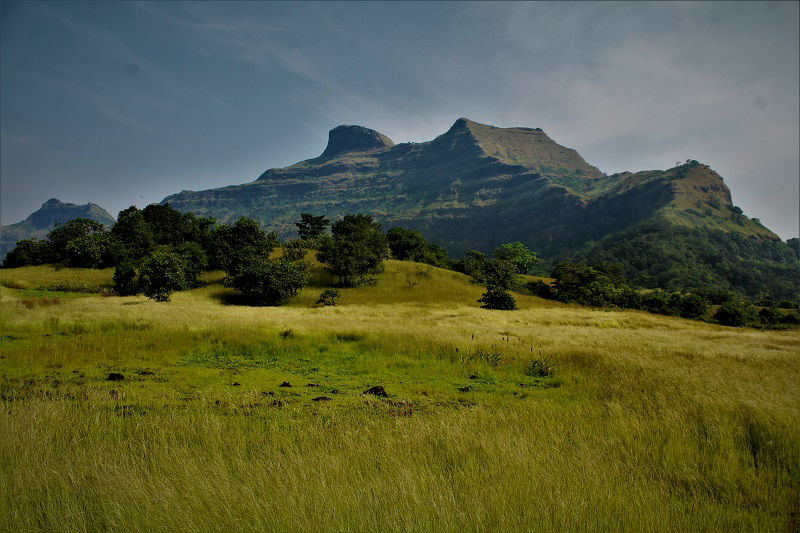 Just take that, after few minutes of trekking you will cross the valley as the Andharban jungles are located on the opposite side of the start point. 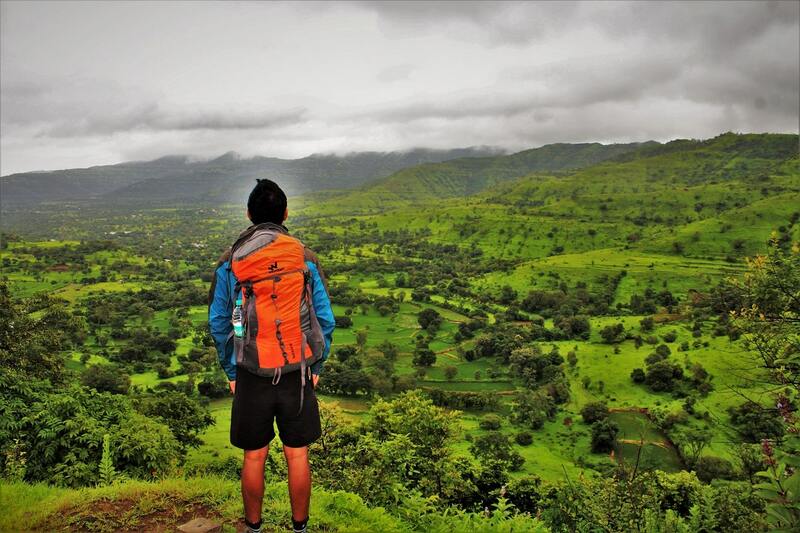 I began from Pune around 3:00 am and with the assistance of Gmaps, I reached the start point around 4:30 am. It was dead silence there and because of amazingly foggy conditions in the range, the visibility was extremely low. 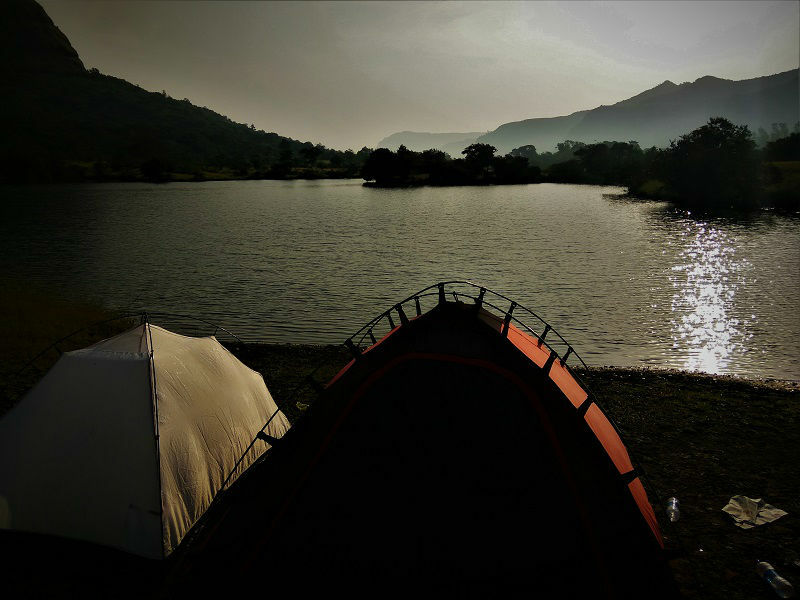 I set up my tent close to the little Pimpri dam and snoozed till the dawn. I began the trek around 7 am. The ground was smooth under my shoes, the leaves were brushed up against my feet, the light of the sun filtered by the tree foliage on each side of the trail. 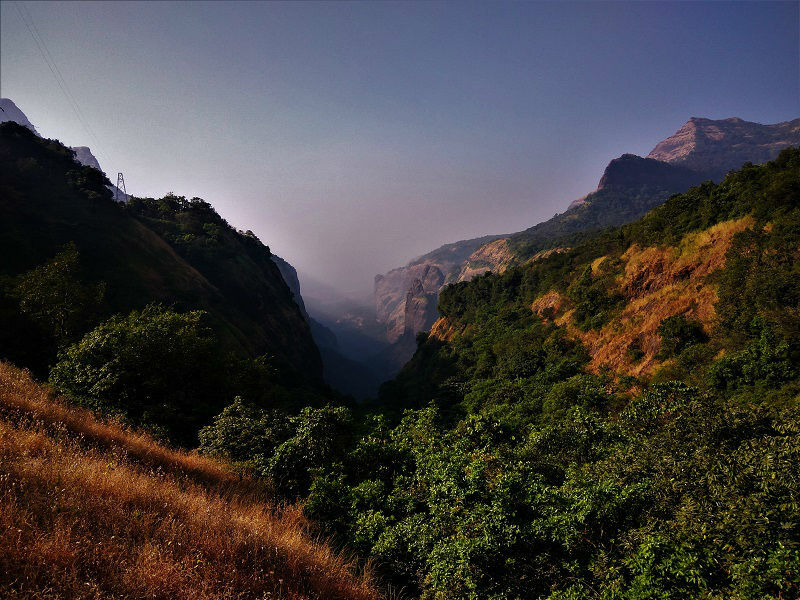 The whole 12 km trek(one-way) goes through thick wildernesses of Andharban. The heat and humidity pressed in on the skin making me sweat pointless, on the other side the air tasted both sweet and fresh, like flowers blooming on my tongue. The sweet jungle fragrance was almost cloying. Every view was unique but the same all at once. 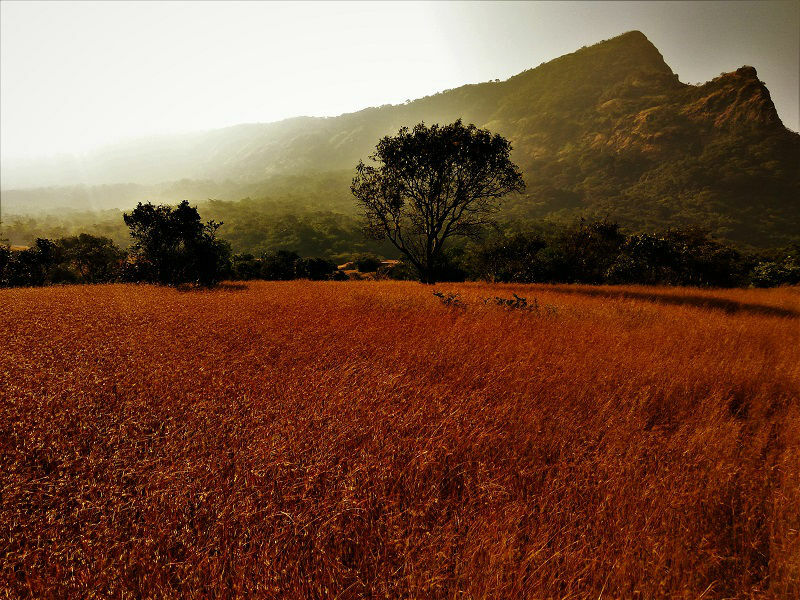 Yes, this is the Andharban jungle irresistible beauty which can make you pen down your Shayari about the dreamy journey into it. There was nobody on the whole trek. Yes, nobody. 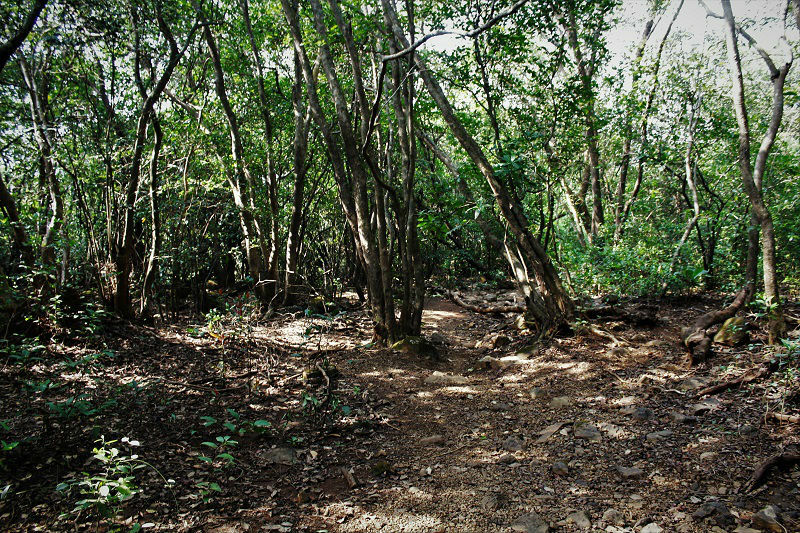 The trail was confusing because of recently developed bushes in the rainstorm season. I lost the trail couple of times however, I knew the end point (Bhira Dam), thanks to the technology(GPS). In the wake of trekking nearly for 3 hours, I made it to the Bhira dam. To get a look at completely crystal clear waterfalls, pouring persistently amidst the dense forest, trek to Devkund waterfall. The waterfall trek is a dream trek for the explorers searching for a moderate hike which leads to an outstandingly beautiful waterfall. The trek is 7 kms long (one way). Try not to pass by the markings on the google maps, they are deceiving. Because of a couple of accidents in most recent few months, now it is mandatory to take a guide. The same can be hired from the start point parking area and charges are 100 INR per person. 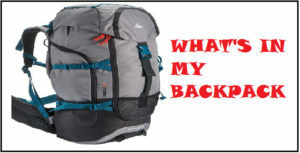 I didn’t know about it before the trek and somehow they didn’t see me entering the trekking range. Note: If you not doing Andharban and want to reach the start point of Devkund Waterfall trek, just search Bhira, Patnus on Gmaps. Ask any of the local for the parking from where the trek starts. You will have to compulsorily take a guide over there. 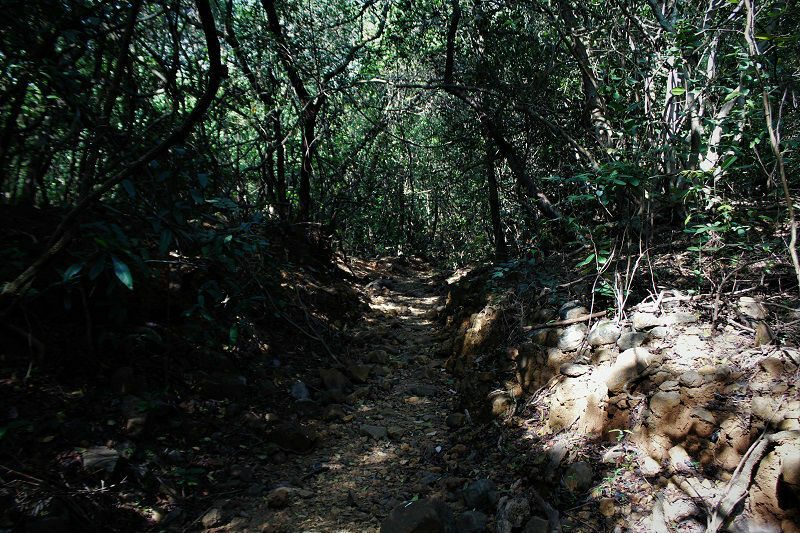 Because of the incidents, the trek was shut for 3 months and because of this the trail nearly vanished attributable to the growth of new bushes in the monsoon. I lost the right trail and found myself in a thick forest, unknowing of which way to go. I could hear a river flowing close-by, and as I had constantly heard that on the off chance that you are lost in jungles, search for waterways. After a considerable measure of look for the way to get down to the river, I figured out one which seemed minimal troublesome. As I put my initial step to get down, the other second I found myself around 10 feet down. My clothes were ripped!! I somehow figured out how to reach the river, and took a bath to rejuvenate myself. Fortunately, I found a fisherman over there and he guided me to the correct trail to Devkund Waterfall. There is no enormous climb all through the trek barring the last 20% which requires 300 feet approx. of gradual ascending to reach the waterfall. 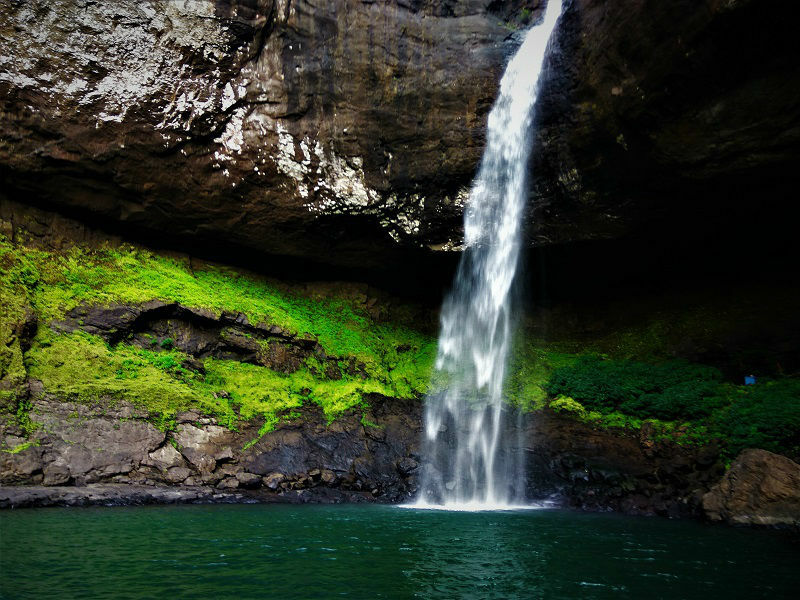 An incredible sight to behold would be the moment you reach the waterfalls!! !Just stunning. For the return, I took the same route (12+ 7 kms) and it took around 4 hours to reach the Andharban trail start point. You can likewise pick to camp at Bhira for a night, on the off chance that you are worn out to go the distance back. There are no food options on the whole Andharban trek. Additionally, there are only a couple of eating out joints on the Devkund waterfall trek. So I would propose you to carry a couple of eatables alongside you. Such a large number of things occurred to me amid the whole trek. In any case, I learned a great deal from every one of the encounters. Scrubbing down in the waterfall and waterway, strolling alone in the wildernesses for a considerable length of time, camping close to the dam is a couple of minutes I would esteem and recollect for as long as I can remember. 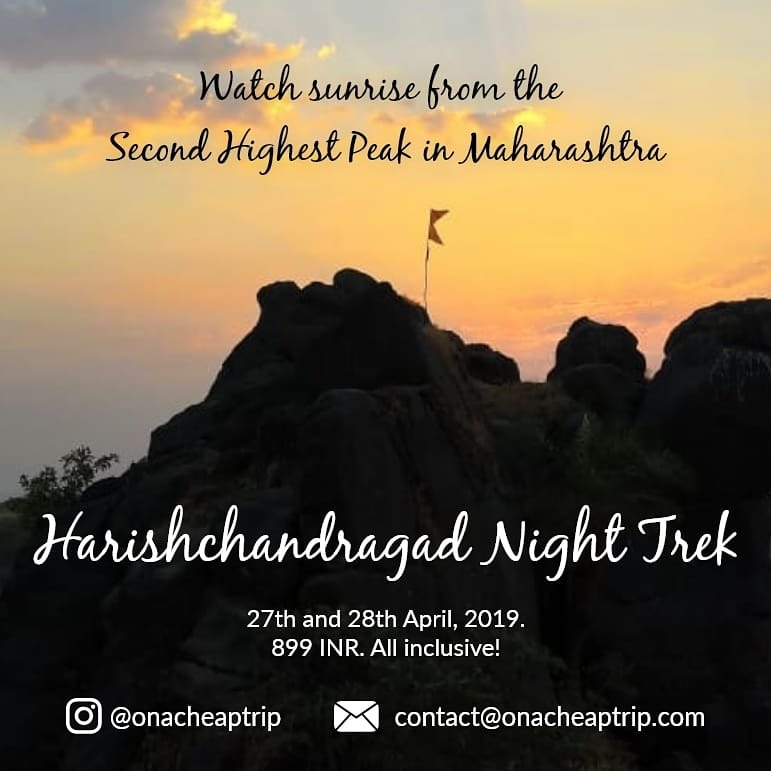 Try not to miss this trek, in case you are nature sweetheart and want to explore it, and want to write something like I wrote this one – by imagining it then, this is yours…! This place is so alive it makes the city seem barren. In the jungle I was inconsequential, yet I felt like I belong. I may live in a tower of concrete but my heart will always live here. 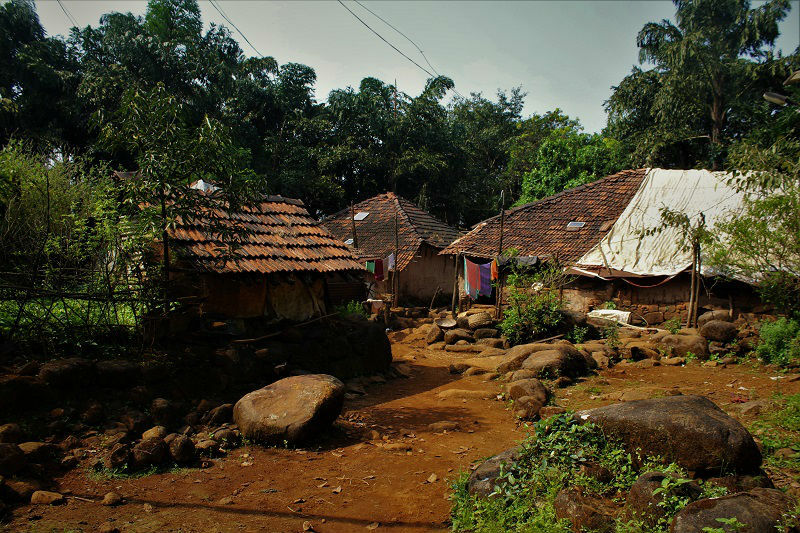 Forest department revokes entry ban at Andharban, Sudhagarh forests. The forest department plans to develop an app for entry permission. After crossing 200 entries, the app won’t accept further registration for that particular day. The entry fee is yet to be decided. 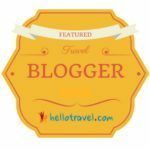 Hey Abhishek, Wonderful blog and lovely pics. We are from Bangalore. Planning this trek in the first weekend of March. Is camping allowed and from where do we take permission from forest department? Thank you! Hey hi Imran, thank you for the appreciation. Yes you can camp at the start point of Andharban trail( there is a small dam over there). As of now I guess no permission is needed. 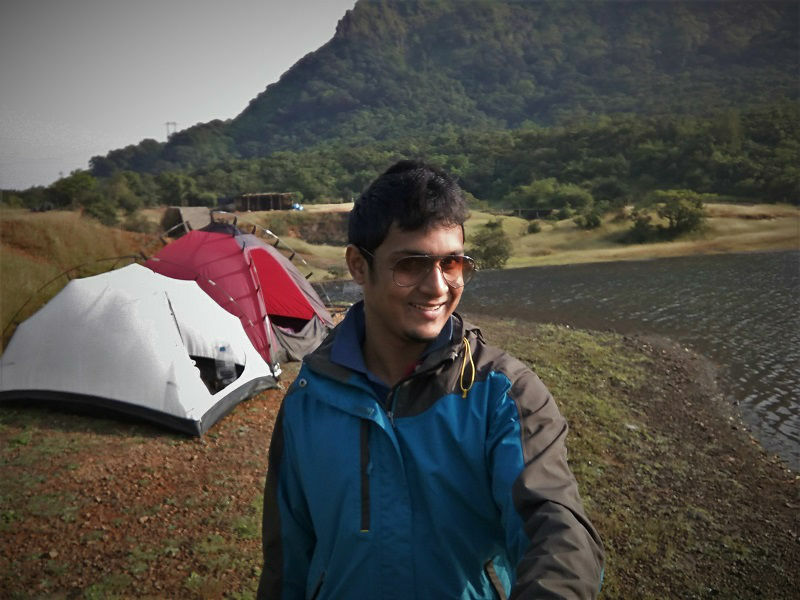 Hey Gururaj, that’s great to hear that you are planning a trip to Andharaban jungle trek and Devkund Waterfall. Yes, you can park your bike at the start point of Andharban trek just near to the dam. It’s absolutely safe over there. Happy traveling!!! 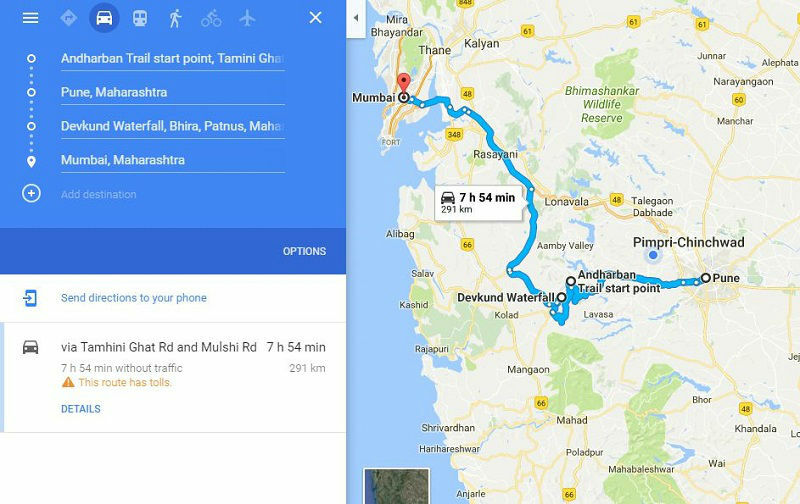 hi, any transport available from Lonavala railway station to pimpri village? Can I have GPS trail map of this trek buddy? Sorry, I don’t have GPS trail map. 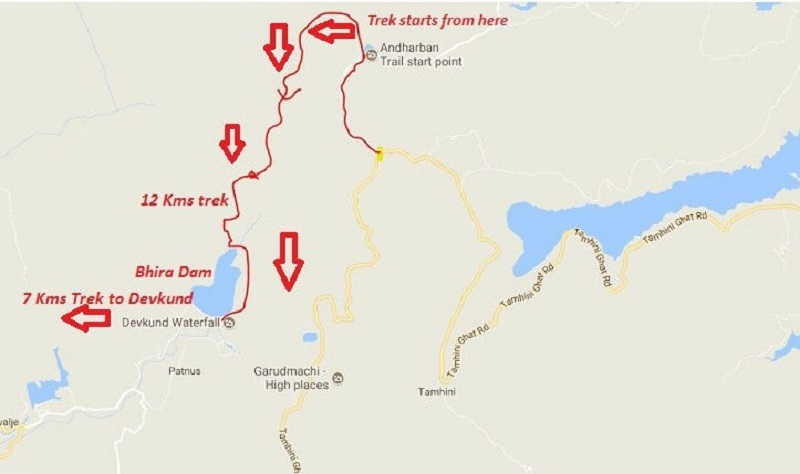 What you can do is, once you reach Andharban Trail start point (search on Gmaps for the same), search for Bhira dam. You must trek keeping your GPS ON and just keep a watch on the blue dot on Gmaps, that you are approaching near to Bhira dam. I hope you got my point.